It has a little bit of a 1940s vibe all made up that it doesn’t have on the pattern envelope, doesn’t it? Editorial query: do people want me to post sources for the mouseover text on the pictures (when it’s not just straight-up jokes)? Almost everything is searchable with Your Favorite Search Engine, but would it be helpful to include them here, or would it ruin the fun (such as it is)? I’ve made approximately one million shirtwaist dresses, and my sleeves *always* have a bit of visible gather at the top. I think this is partly because I set them in flat (I know, I know) and partly because I just don’t have the patience for easing and steaming and fiddling. And, you know, not once has somebody turned up a nose at the sleeve placement on one of my dresses, so I’m not going to worry about it. Actually, the print you’ve used here is so busy, I don’t think any of us would have noticed if you hadn’t pointed it out to us. The sleeve caps add to the 40s vibe. that is a very cool dress. It’s more of a test if you don’t tell. I fail most of the time. Shows up my philistine status. I don’t mind that. 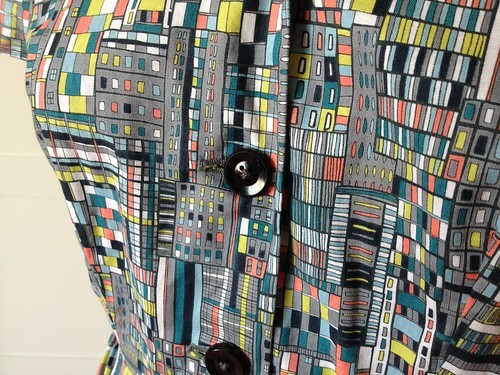 Great fabric! And I rather like searching for the things I don’t know of in the mouseovers – I see it as a little education vacation in the internet. To add light to London population, [the mouseovers], in the late 1500’s to early 1600’s, Cahokia in what is now Illinois, had a native American population of over 60,000 people—twice the size of London at the time. Great dress! 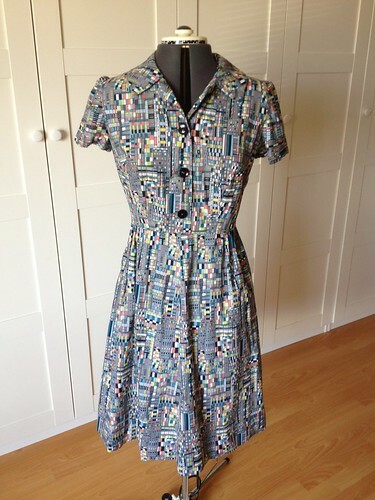 It looks both 40s and modern with the print you used. 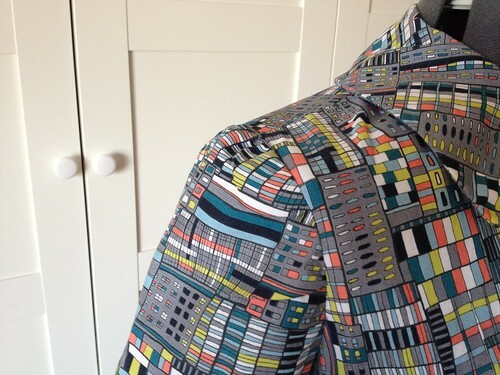 I think the plain buttons are just right – anything else would probably get lost in the pattern. Gah! Never noticed the mouseovers! Thanks! Love your site and your column in the Wall Street Journal. I am enjoying “100 Hundred Dresses”, but wonder why all of them have a side zipper. When I began sewing in the late 50’s, I made a few dresses with side zippers, but most of the dresses I have made have back zippers, which I prefer. 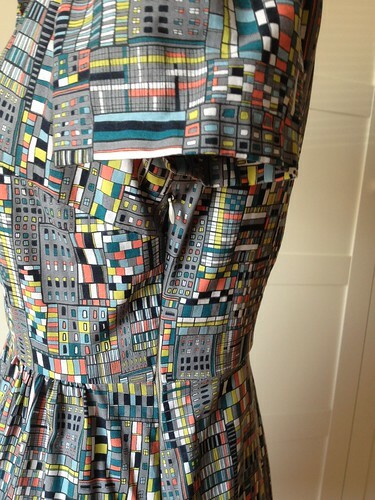 I would think that this dress with a front opening wouldn’t need any zipper. 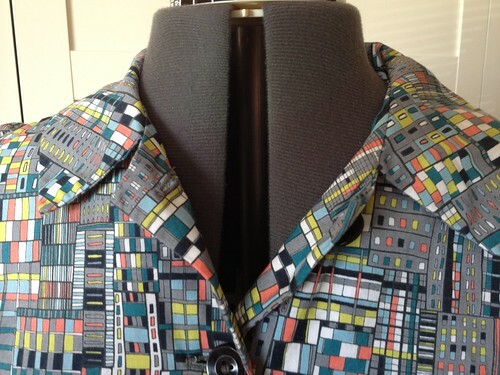 Do most of the vintage patterns call for side zippers? Mmmmmmmmm I really like that one! I wouldn’t turn my nose up at sources! This sounds a little like Hans Rosling, but I don’t think it is. Very snazzy dress, btw. I didn’t realize there was mouse over text so I’m glad you brought it up. I enjoyed it. Adds a special vibe to the dress. I’ll now think of this as the population dress. Enjoying this feature a lot. 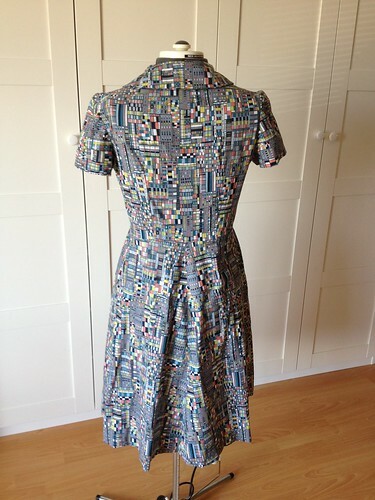 Makes me want to sew a dress or twenty. I enjoy the mouseovers – they are just fun to read and if I am curious, I can investigate on my own. Wow – never noticed the mouseover text before! And I’ve been reading your blog for years! 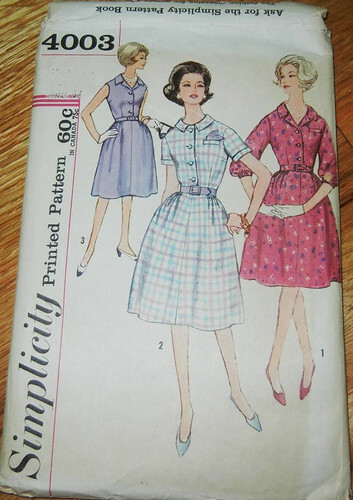 The skirt of the dress appears fuller on the pattern envelope than than your sewn version which I think is what gives it that ’40’s look over the ’50’s look. I like the ’40’s version better. The ’50’s style somehow looks more like mom doing the housework in high heels and pearls whereas the ’40’s is more woman in the workforce. Loving the 100 dresses reveal! And I love reading your mouseovers. It adds another twist and makes me think. I agree with Cindy as to investigating more on our own. Great way to squeeze a little lateral thinking and side learning into the day.